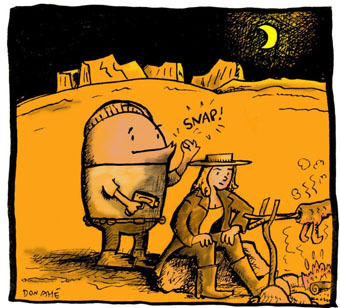 My friend Tom has a new book of his comic “Marooned” coming out…. um, sometime. Anyhow, I’ll pimp his book when it’s actually out, but just so you know, I did a guest comic for it, which he sneak-peaked the first 3 panels of. Check it out. I had a nice afternoon. Went over the rest of the Spacetrawler strips for the year/book#1, and they’re coming together. Dan stopped by briefly, and he helping me hash ’em up. Then my girlfriend and I walked down the street in the sun and got a burrito. Good times. @Meirnon: Potty-bot has the first line, Pierrot is wailing. @Captain Jack, ummm. Why yes. It does. You should see what it can do with the upgrade. I am not a fan of that fan art. I assume Potty-bot will also provide food and drink. I love the bottom panels. But what will he do for food? I’m thinking Pierrot doesn’t think it’s so romantic anymore! Hehe. Fun stuff. Pierrot needs to give his potty bot a name. It almost seems like a faithful dog by this point…or a creepy stalker. @Coyoty, lol! That’s cool. Well, we can’t all be a fan of everything, thank goodness. McGee, possible “Danae” after the greek myth? Poor Pierrot. However, I have a feeling that the potty-bot will win him over. 😉 The bot should be able to provide water from processing the provided…err… inputs? Remember “Dune”? Imagine opening that panel to see a human cuffed to a pipe, pants pulled down and a couple of strategically placed hoses? Even if he is discovered, I would think the person would quickly shut the panel, shake their equivalent of a head, and scurry away. um, 4 days? how does one survive without food and water for 4 days? and you expect him to pick up the peices in that condition 4 days from now? Hand-cuffed in the dark for 4 days, no food or water, and only a talking urinal as company… yep, I think Pierrot has just found hell. Is anyone else having trouble with the bit.ly links found in the comments on the last couple of pages? When I click them they just send me back to the page they’re on. Hey @Rags, that post that Lauren posted is actually a mirror of what she posted on twitter. You can view it by clicking on her name. If I get a chance, I’ll look at my plugins to see which one I’m using to do that, because it’d be awful nice if it actually indicated it’s a mirrored tweet and not a post here (so that the self-reflecting link makes sense). She do that to me, and one kill the other four days after… “suspension of disbelied”, arghn that’s hard.